When we played Magic Rooms‘ Atlantis – and this may still be true to a certain extent – it was relatively unknown in enthusiast circles. Whenever we visit a new city, I try my best to make sure we visit some of the newer rooms to see if we can uncover a hidden gem, and that’s exactly what happened here. We turned up to the location pretty much dead on time to find the door but no one there. If you do decide to visit, I highly recommend taking a printout of the directions or accessing the website on your phone, because it’s very likely you’ll think you’re in the wrong place if you don’t (and possibly even if you do). The door is small, and all that was there to tell us we were in the right place was a half-torn sticker. The website makes the point that there’s a big set for their games, and that rang true with the size of the waiting area and the walk to the toilets – there was plenty of space on the inside. They’ve already opened a second game, and it seems likely, given the space they’ve got, that a third will follow at some point. From an enthusiast’s point of view, that’s a good thing because it maximises game time over travel time. Unfortunately, the second game is apparently far worse than the first. Disappointingly, the stories are given to you to read on a laminated card. I realise delivering a story in a second language is tricky, but it always feels like a missed opportunity to me. Oooh. The room looked interesting from the moment we stepped inside, and it was clear there were going to be plenty of things unfolding ahead of us. Writing about it raises an interesting question in my head: I usually assume that unlocking new spaces – whether those are rooms, cupboards or boxes – is exciting because there’s something unknown inside. If you can see the contents, does that make it less exciting? Sometimes it does, but other times it can leave you more intrigued, teasing you as to what’s to come. For me, that’s how this game felt on entry: we needed to solve an unspecified number of puzzles before we could experience the next stage, but that next stage filled me with anticipation. The result was that puzzles that I might otherwise have found uninteresting became more exciting because I knew *why* I was solving them. As mentioned above, they claim that there’s a big set for this room, and that is absolutely true. It was certainly one of the biggest spaces I’ve played in, although I wouldn’t say it particularly added to the game. 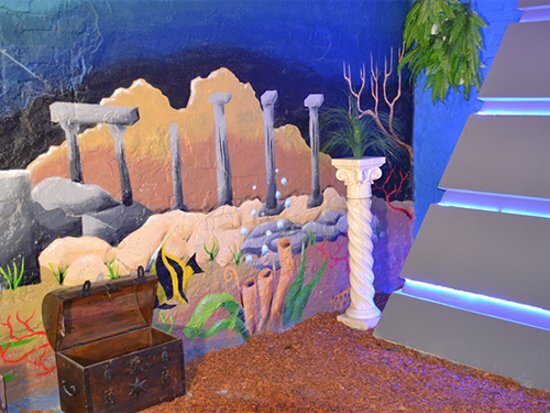 The water theme runs throughout the experience, as you’d expect, and it’s accomplished in several different ways: the colouring and lighting of the room, the background decoration and, almost inevitably, water in the puzzles themselves. I was particularly impressed with the subtlety of the room being almost washed out in blue to give that underwater impression. When I recall the room, it’s in a very muted way, as if I could almost sense the weight of water above us. There was a reasonable number of puzzles, ranging from low-tech locks and keys to medium-tech “magic” puzzles where, once we solved a puzzle in one place, something would happen elsewhere (which is fitting, given the company is called Magic Rooms!). There were enjoyable, physically interactive puzzles, if that’s what floats your metaphorical boat, and a couple of trickier mental challenges to keep the more cerebral entertained. Throughout the game the puzzles seemed to fall relatively easily, so there was a constant sense of progress (we escaped in 29 minutes without a clue). All the puzzles had sensible answers, although one left us a little perplexed as to how exactly we were meant to enter the solution. I felt that was a weakness that could have been avoided but, with a little bit of playing, you’re likely to continue without issue. This is a visually enjoyable room with a nice range of puzzles to entertain you whatever your preferences. It’s a little on the easy side for my liking, but there are certainly puzzles there that could hold you up, so don’t go in assuming you’ll race through the game. It’s a shame that it’s outside the centre but, if you fancy the stroll or don’t mind sorting out transport, I think it’s well worth a visit. I didn’t play here, but Mrs Logic and a couple of other friends both took part and rated it as terrible. Don’t make the mistake they made and book the double header!